Clarins latest foundation is a pot style cream foundation. Presented in a chunky, heavy glass pot that contains 30ml of product this is not ideal for carrying in your makeup bag but great on your dressing table. A mini plastic spatula is included to spoon out the product for hygiene. This foundation is geared towards a mature skin that is more on the dry/dehydrated side however I have an oily skin and it has sat nicely on my skin all day although I did put a fine loose powder down my T-Zone. Now this is very creamy and thick so if you like a full coverage you will enjoy wearing this foundation. If you prefer a more natural coverage then apply it sparingly using a duo fibre style buffing brush. This will pick up less product and allow you to evenly buff it into the skin. 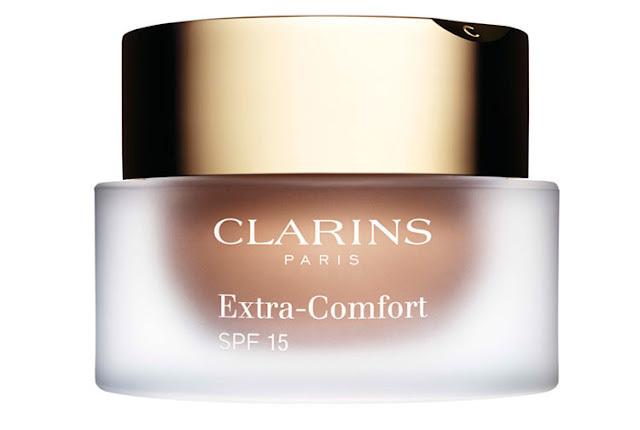 It blends into skin easily and leaves a moisturised radiant sheen on the skin. Sam actually commented on how glowing my skin was when she came into the office! This foundation made my skin feel moisturised and plumped with the light literally bouncing off my skin. Despite being creamy it didn't sink into my fine lines and lasted all day with only a touch up of a blotting sheet and blot powder at 3pm. On my hand above you can see how it smoothes out the skin and gives a radiant glow. Organic Oil which is rich in omega 9 and omega 6 both of which help to plump and rehydrate the skin. Global Age Defy Complex which helps to increase protection of collagen and improve skins firmness. The highest ingredient in this foundation is Titanium Dioxide which is what gives this foundation its lovely radiance however this is also the culprit for flash back in pictures unfortunately. I tested this and my skin did indeed flash back slightly and you can see in the picture above the foundation shows up slightly lighter under flash. Therefore if you are someone who likes to take the odd selfie or are getting married etc then I wouldn't opt for this product but for an everyday foundation this looks radiant, fresh and flawless. Available in 9 shades from a pale ivory through to the colour Cappuccino which would be around an NC44 in MAC terms. All colours that I have seen tend to come up slightly more pinky so be aware of this if you have a more yellow skin tone. I wonder if this is similar to the Dolce & Gabbana creamy foundation that also comes in a glass pot?